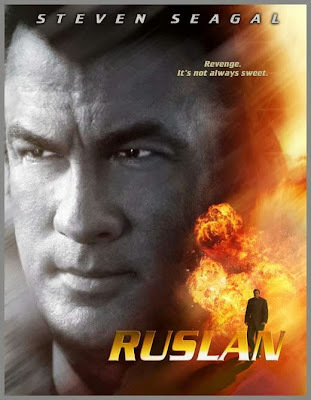 Ruslan (Seagal) is a writer and three-cup-monte enthusiast who uses his experiences as a former mobster for his books. While living in L.A., he gets word that his daughter is getting married so he travels to New Jersey. While there, he discovers the family she is marrying into also has Russian mob connections. After some of those baddies put her in the hospital and murder some family members, Ruslan reverts back to his old persona and he goes after the people responsible. Will he get revenge? It’s best to go into these newer Seagals not expecting much. It truly is a case of managing your expectations. But Driven To Kill is just dour, bleak and boring. Compare it to the fun of Urban Justice (2007) and you can see the contrast right away. One of the main problems is Ruslan is not a hero, not even an anti-hero, he’s just a brutal, amoral, amazingly unlikable monster. You don’t root for him to succeed; in fact, you end up rooting for the people he’s (usually unnecessarily) viciously murdering. Considering he tortures, kills and impales people with the slightest provocation, Ruslan is more like Jason from the Friday the 13th series than an action hero. But because this movie in general, and Seagal in particular, is so humorless and self-serious, some entertainment can be gleaned from that. Also his voice is funny, as usual - instead of an absurd Cajun accent, now whoever is doing his ADR is trying his hand at an absurd Russian accent. 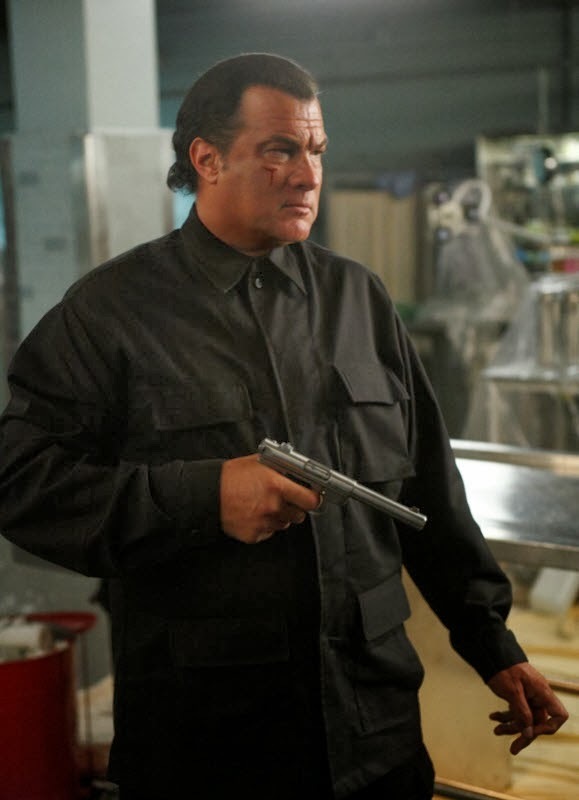 He’s (and by He’s we mean the anonymous voice actor reading Seagal’s lines) is really stretching his acting range. And because his voice is so soft, you need subtitles once again. Looking at Seagal’s triangle of Eddie Munster hair, we realized he’s just the modern-day equivalent of Jalal Merhi: An unlikable, overweight actor/Martial Artist of limited ability. But Seagal continues to put out product, and Merhi doesn’t. That’s the only difference really. As for Driven To Kill, you don’t really care about the characters, especially Ruslan (unless you feel bad for all the basically innocent people Ruslan has mercilessly slaughtered), and at 97 minutes, it truly stretches your patience. That’s a long time to spend with Ruslan, a guy you wouldn’t want to spend 3 minutes with in real life. Add to that some CGI gunfights (complete with CGI muzzle flashes, CGI bullet hits and CGI smoke), some knockoff of a Powerman 5000 song, and some filler, and you’ll be wishing for the days of Seagal’s “Patty Cake” Martial Arts style. As the latter-day, Direct-To-DVD Seagal output goes, certainly some are better than others, but Driven To Kill represents a low point in this phase of the man’s career. Driven To Kill? More like Drivel to Kill. Also check out reviews by our buddies, Saturday Night Screening, Cool Target and DTVC! 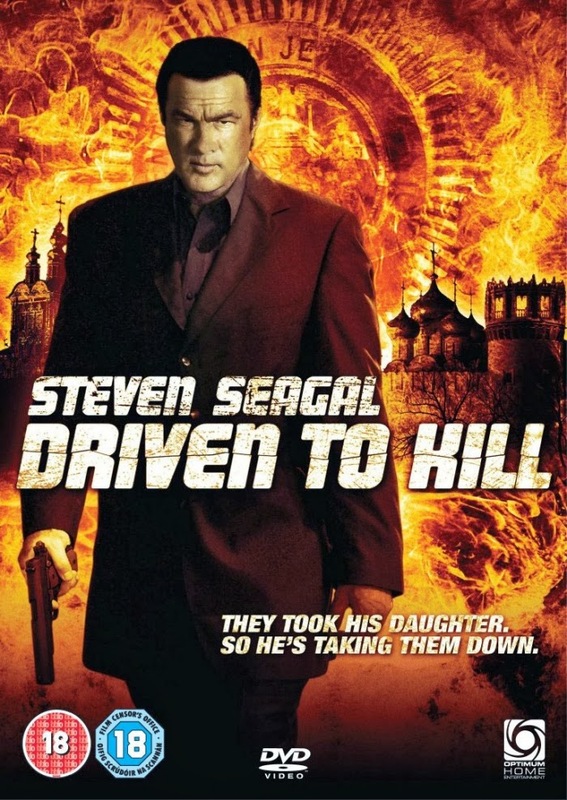 Another Seagal movie indistinguishable from most of his other movies. Since he made four movies in 2009, I guess he has to cut corners on the quality somewhere, as long as it's not on the catering. Definitely have to strongly disagree with you here, I thought this was a great Seagal film was cool action scenes, and I actually did find myself rooting for Seagal's character here in spite of his brutality. Roger: Haha. He loves his catering. He needs to change it up now and again...or try harder. Venom: It's hard to beat Urban Justice. This was pretty weak. Seagal phoned it in. Haha. Have you checked out Seagal's latest (THE MECENARY- ABSOLUTION) yet? It actually had a limited cinema release (despite being not as good as DRIVEN TO KILL imo) I reviewed it on my blog, I'd be more than interested to read your review of the movie. Even though we didn't enjoy Driven To Kill, we will still check out Absolution soon. Also have to see A Good Man. How was that one? Appreciate the Stout Sensei update.